Desirée Rogers, 51, the former White House social secretary, has been named chief executive officer of Johnson Publishing, which publishes Ebony and Jet magazines. Linda Johnson Rice, the daughter of company founder John H. Johnson -- who died in 2005 -- will continue as chairwoman. 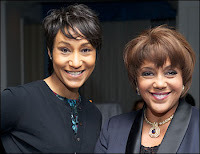 According to a company statement, Rogers will focus on "aligning core business strategies for all brands.," Johnson Publishing was founded in 1945, targets the African American market and remains the largest African American-owned publishing house in America. Elwin Cotman: "The Jack Daniels Sessions EP"
Will Lady Gaga Go Green With Environment Man?